It’s February, which means love is in the air…and unfortunately, so are germs. You don’t have to be a medical professional to know that doctor’s offices are especially crowded this time of year, with low temperatures bringing lower immune systems. Employers no doubt are struggling to find effective ways to remain productive as employees take higher rates of sick days and navigate the healthcare system. And if you have tiny petri dishes – ahem, children – like me, you’re on high alert this time of year for the first sign of illness in your home. However, even with the best sick-day plans and policies – or the most vigilant of parenting or hand sanitizing – few people can evade the cough, cold, or flu for long. Sickness happens. And when it does, it often means taking time off from work and/or bundling up sick little ones to make expensive in-person visits to the doctor’s office or urgent care facility (or even the ER) – with rising care costs literally adding insult to injury! Technology has changed all of our lives in meaningful ways. I love that there’s an app now for almost anything from food to fitness, and that FaceTiming helps me stay connected to far-off loved ones. That tech-enabled convenience and connection has revolutionized healthcare, too, ushering in greater access to comprehensive care through telehealth. 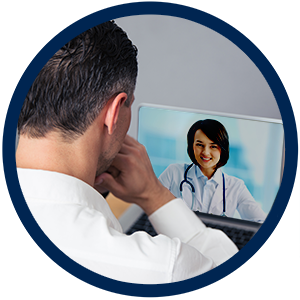 The telehealth benefit has become a must-have for employers, growing from 46% adoption among large employers in 2015, to 96% adoption in 2018 (according to the National Business Group on Health’s Large Employers’ Health Care Strategy and Plan Design Survey). However, that same survey found that only around 8% of employees actually use their telehealth benefit – and that’s only among 20% of employers. Having technology at our fingertips is great. But when it’s the middle of the night, and you or your child has a high fever, and your primary care doctor’s office is closed…who remembers how to get in touch with their telehealth provider? And who remembers that telehealth is an option if they’ve never used it before? Even if it takes just a few minutes to download the right app, get registered and talk with a doctor, these preliminary steps can add to the stress when someone isn’t feeling well. However, for those employees that understand the benefit and have downloaded and registered with their telehealth app, accessing care for a wide range of ailments is as quick and simple as a few taps on their mobile device. To help knock down these common barriers to care, I’m proud to announce that Empyrean has joined forces with Teladoc Health, the most recognized telehealth provider in the market. This Preferred Partnership will strengthen your employees’ early awareness and engagement with their telehealth option: Members will be made aware of the benefit right during enrollment when selecting their medical plan, and they’ll be encouraged to register with Teladoc early. This way, your employees will already be set up to use the service and can have the convenient app downloaded right when they need to use it. Not to mention, as more employees enroll in high-deductible health plans (HDHPs) to manage their families’ healthcare costs, using Teladoc’s lower-cost service helps bring predictability and transparency to the cost of their medical care. Leveraging telehealth can potentially save thousands of dollars over an urgent care or ER visit, reducing healthcare costs for employers and protecting HSA savings for members that haven’t met their annual deductible. With powerful engagement and proven cost savings, the Teladoc and Empyrean partnership makes more sense than ever, and helps further drive our mission of connecting benefits and enriching lives. Combining the secure, HIPAA-compliant systems of both organizations to bring employees and their families a cost-effective, convenient, and nationwide healthcare option is an exciting way to share a little love this month – and will last far longer (and is certainly healthier!) than a box of chocolates. Learn more about Teladoc Health, and explore more about Empyrean’s holistic approach to benefits through our Preferred Partner Network.